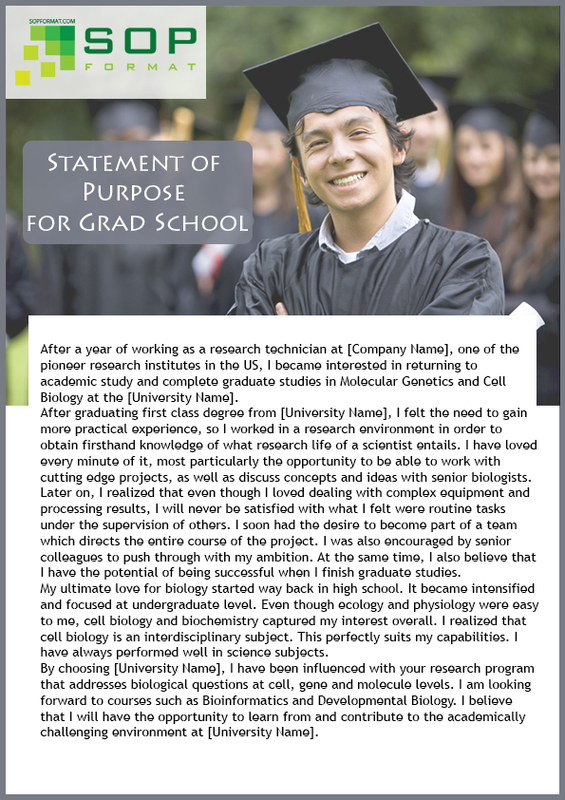 Why Is Your Statement of Purpose for Grad School so Important? Getting into any grad school is not going to be easy. Many are highly competitive and admit just a small percentage of those that apply. You therefore have to ensure that your application will show you off in the best possible light. With many of those competing against you having equally as good qualifications your statement of purpose will often be the only part of your application through which you can make yourself stand out. This means ensuring that your statement of purpose for grad school format and writing must be perfect if you are to get noticed. What Is the Correct Statement of Purpose for Grad School Format? Review the application instructions with care to see if they have any formatting instructions: if they do then you must follow them correctly and to the letter. Use a font such as Calibri or Arial that will be easy to read, never use scripts or fancy fonts. The size of your writing must be a minimum of 12pt. Keep your margins clear and wide: they should be at least an inch on all sides. Print using black ink only on good quality white paper: your statement should not be decorated or use colors. Do not ever use all CAPS for anything and be sparing in the use of any bolding or italics. Ensure that you know what they expect from your statement: check their requirements with regards to formatting, length and any prompt that you may need to answer. Always follow instructions fully and do not deviate from them. Understand what they want in a student: review websites and program information so that you can fully understand what they value in a student. Make a prioritized list so that you can reflect these qualities within your statement. Brainstorm what you need to include in your statement: create a list of how you match their specific expectations. Outline the statement: this will help to guide your writing and to ensure that you cover all of the points that are expected within your writing. Check your writing with care: simple mistakes can sink your application as they will totally ruin the first impression that you make. 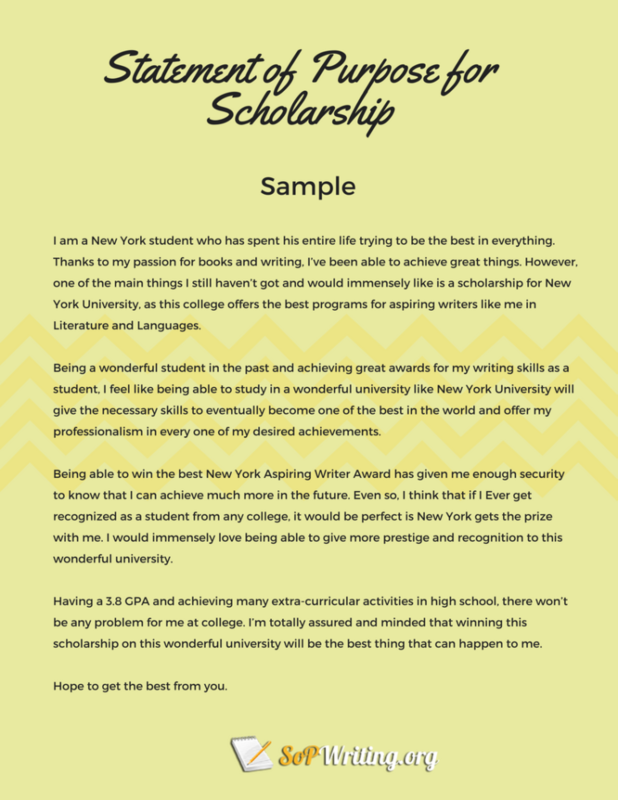 Review our statement of purpose for grad school sample for ideas: a good sample SoP for grad school can provide you with a huge amount of guidance as to what should be covered and how. Tell a story: your statement of purpose is not a list of your skills and achievements. You need to tell an engaging story that will get and keep the attention of the reader and make them remember you long after they have read your application. Use an anecdote: the best storylines will always come from a relevant personal anecdote that helps you to show your dedication to your subject area and future career. Make your opening attention grabbing: you have to wake up the reader and get their full attention with your first line or two. You must make them want to discover what else you are going to have to say. Use language that is easy to understand: do not try to be clever with your writing or select obscure words that no one would ever use in everyday speech. Don’t use language that would be seen as poor: avoid slang and profanity and even acronyms. Be concise with your writing: avoid any form of filler. Your word count is limited so if you can say something in a dozen words don’t try to use 20. Demonstrate what you are capable of: don’t simply say you are good at something without supporting it with a clear and powerful example. Write positively: you should be explaining why you want to do something, not why you don’t want to follow an alternative route. Stay relevant: if something is not going to help you to gain the place that you want then it does not belong in your statement. Plagiarism: you cannot simply copy any sample statement of purpose for grad school and present it as your own. Many check for plagiarism and even if it were not checked it would not truly reflect what unique qualities you offer. Repeating information: the committee will not want to see you repeating the information that is in your resume in prose form. Your statement should add additional value and information to your submission. Complaining: even if you have issues with your past school or anything else, your statement is not the place for you to vent those frustrations. Making excuses: unless you are told to specifically cover any areas of weakness you should avoid mentioning them within your statement. Lies and exaggeration: you must be honest within your statement. It is very easy today to check the facts of any statement. Often issues will be discovered during the interview process. Paragraph1: This paragraph in your SOP should be used wisely as elevator pitch and always condense it within 5 sentences. This paragraph should be used as better introduction about yourself too. Also, mention in this paragraph your applied program specifically too. Mention little about the successes and accomplishments been part with you in the past academic tenures. 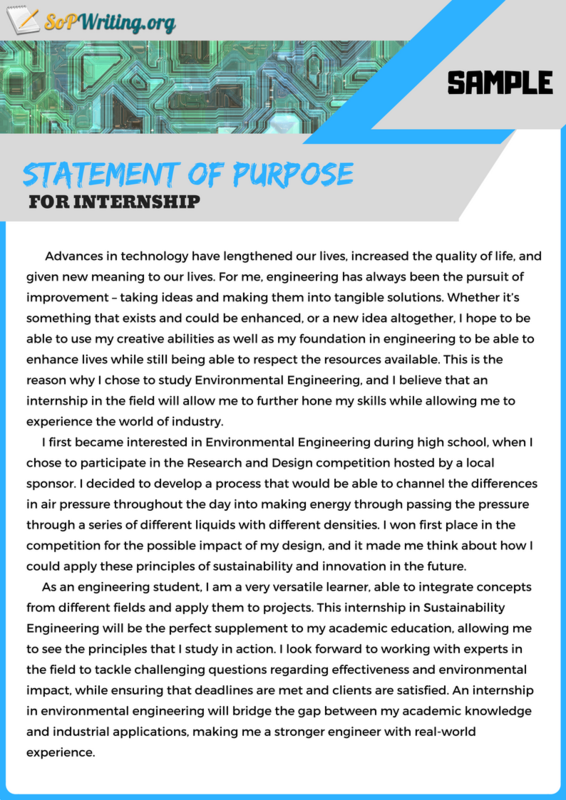 Paragraph2: This paragraph should be used as main body of the statement of purpose through mentioning details in chronological order about your education, experiences and other skills and achievements. Details about these accomplishments should be more serene in a way those should found as suitable to take up the chosen program by you. You should display your skills and abilities in full extent in this paragraph and use them wisely with your experiences. For example, you want to mention that you’re hard working individual. Then, keep it as “ I am an hard working individual and proved myself as competent enough while working as volunteer in medical camp”. This way sentence will indicate more about your ability to work hard besides presenting well the volunteering experience in the better way to the selection committee. Paragraph3: This is another important paragraph in your SOP. Use this paragraph wisely and limit to short and brief. In this paragraph, create a great relationship with the paragraph 2 contents and the chosen program. This relationship between program and accomplishments should be used to elevate the candidature as suitable one for the admission. Paragraph 4: It is a wrapping paragraph of your statement of purpose. Create some closing sentences with request to consider your candidature for the program. 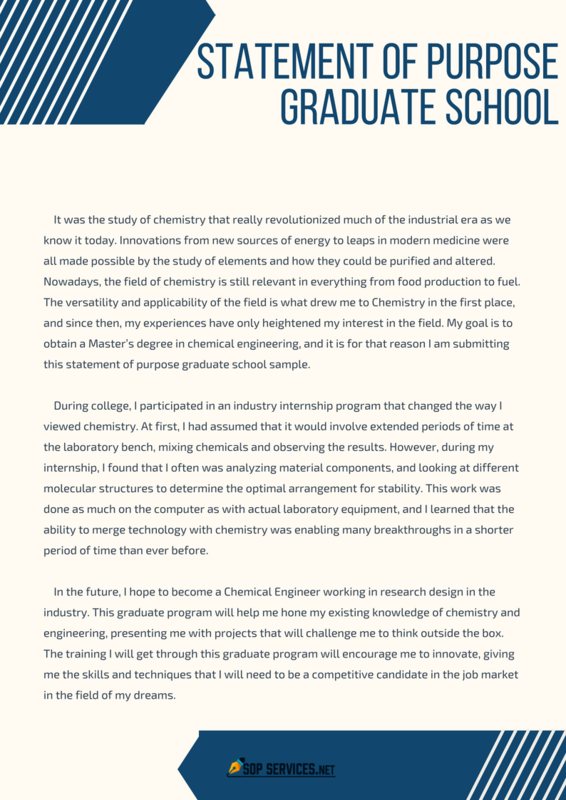 Also, mention your future plans after successful completion of the program in two or three sentences in this paragraph. It is always wise to keep this paragraph quite pleasing and convincing. Also, make it sure that the closing paragraph is not too long too. Mention that you will be looking forward to hear the good news from them about the admission in it too. If you have despaired to find the right service for you with the best quality/price ratio, be sure to check this post on sample SoP for PhD. SOP for grad school as well as SOP for MBA is suggested preparing with our special format sample. For more inspiration see the leading University’s tips on Great statement of purpose for grad schools. In fact, our format sample provided here will be subjected change at regular intervals based on the changing guidelines of admission procedure and changing trends in the system. Use our format sample wisely and keep up your admission success chances alive always. We can offer you law school personal statement format and many other ones now. Use our tips and samples to make your statement of purpose for grad school perfect! ← What Is Law School Personal Statement Format?